Atlanta, Georgia – February 7, 2019 – Nationwide tax specialty firm KBKG recently promoted area resident John W. Hanning to Principal. John leads the firm’s Southeast practice, including a team of engineers and specialists based out of KBKG’s Atlanta office. John joins nine other principals on KBKG’s leadership team. 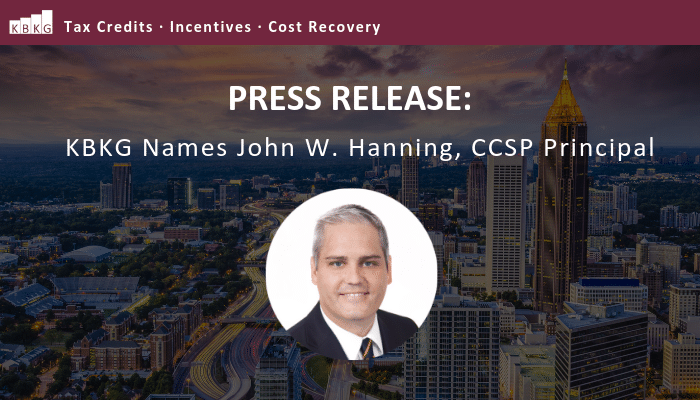 John’s primary responsibilities include servicing capital intensive clients with value-added services relating to Cost Segregation, R&D Tax Credits, Green Building Tax Incentives, and more. Additionally, John is a Certified Member of the American Society of Cost Segregation Professionals (ASCSP), an organization that requires members to adhere to a strict code of ethics and standards. Currently John severs on the ASCSP Board of Directors as Treasurer. 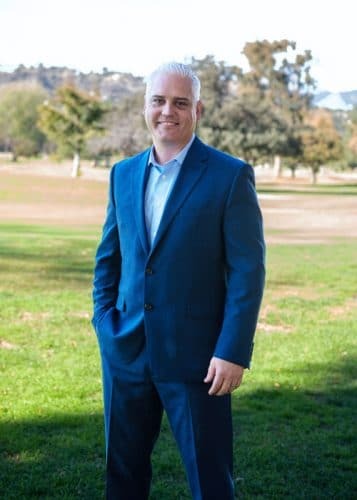 John is a council member of the Washington D.C. Real Estate Roundtable group, a non-profit organization focused on policy areas governing tax, capital and credit, environment and energy, and homeland security. John is also a nationally-recognized author and educator. John’s work has been featured in publications such as Accounting Today, CCH and TaxPro Today. As an active member of the community, John frequently volunteers for organizations such as Habitat for Humanity & Family Promise of Delaware County that are dedicated to helping homeless families achieve lasting independence. KBKG Atlanta opened its doors in 2017, to offer a dedicated, centralized location to service new and existing clients in the Southeast region. The office is comprised of local area natives, led by John, who have partnered with the region’s businesses for years leading up to the office opening. John and his team are also heavily involved in the area’s technology incubators, startups, and small businesses, as they regularly attend and co-host events with Atlanta’s entrepreneurs, providing tips for increasing cashflow when early stage businesses need it most. “John not only cares about his role as a leader in this firm, but he is also passionately invested in Atlanta and the surrounding region. He takes pride in KBKG’s work, which shows through the partnerships he and his team have cultivated within the technology and real estate space. They host events and offer help to anyone in need, be it business consulting or volunteering. Atlanta is lucky to have such a champion for their growth and success,” said Gian Pazzia, KBKG principal. Learn more about John Hanning and KBKG Atlanta. Press release featured on DigitalJournal.com and THRIVE.